I flere år har Miljøpunktet samarbejdet med en række studerende fra Worcester Polytechnical Institute, USA. Her har de studerende mulighed for at lave et projekt omhandlende ét af Miljøpunktets indsatsområder, hvor de kommer ud i felten og arbejder i dansk kontekst. Det er en rig proces for både de amerikanske studerende og de daglige medarbejdere på kontoret, hvor der foregår en del erfaringudveksling på tværs af kulturer og uddannelser. Det er altid en fornøjelse at have de studerende på besøg. 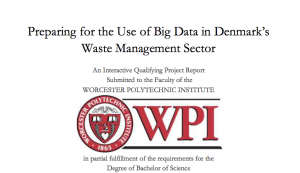 This project explored the challenges and opportunities associated with prospective imple- mentations of big data analytics in Denmark’s waste industry. We found that while some waste management companies collect detailed data, they do not use or share their data adequately. We identified that, to begin implementing big data into Denmark’s waste industry, companies must: expand data collection on internal operations and waste per household; develop better data management systems; and review technical, ethical, and legal practices surrounding personal data on waste. Copenhagen’s vibrant nightlife has become a problem for residents living in the district of Indre By. The purpose of our project was to research, observe, and analyze the behavior of young adults when partak- ing in nighttime activities located specifically in the community of Nørre Kvarter. To do so we interviewed locals, collected existing data, and created a plan to provide our sponsor with guidelines and sustainable meth- ods for reducing noise and waste generated by the nightlife. Our final plan helped our sponsor raise aware- ness about the problem to increase Indre By’s environmental sustainability.